Aberystwyth Pier was designed by noted pier designer Eugenius Birch and cost around £13,600 to build, paid for by the Aberystwyth Pier Promenade Consortium, made up of local business people. In partnership with construction firm J. E. Dowson the pier was opened in June of 1865, measuring 800 feet in length (242 metres) to a crowd of around 7000 people. On the day of opening, all visitors to the pier paid an entry fee in order to help recoup a proportion of the initial building costs. 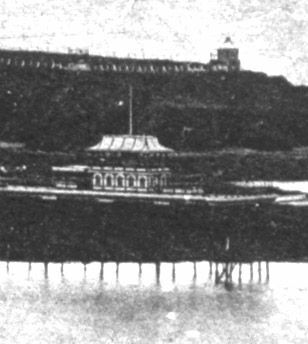 A mere seven months after the opening of the pier, a storm hit Aberystwyth in January of 1866 and a 300ft section of the pier was washed away, leading to the sale of the pier soon after. Six years on, in 1872 the new owners of Aberystwyth pier had replaced the missing section of the pier with a new section measuring a total of 230 feet. The new section was also more slimline than the original section which was damaged in the storm. The new section of the pier also included a gallery and refreshments room, which is clearly visible in the older photos of the pier. By 1878 the pier was hosting afternoon concerts at a charge of 6d, and for those that just wanted to walk around the pier itself, the charge was 2d. In 1896 a new glass pavillion was officially opened by the Princess of Wales, Queen Alexandra on July 26th, on the same day she also opened Alexandra Halls, which is now a university halls of residence on the seafront by Constitution Hill. The pavillion consisted of an impressive glass dome, which sat on top of three seperate aisle sections with a potential capacity of around 3000 people. The new Aberystwyth pier pavillion cost around £1,000 to build and was designed by George Croydon Marks. Marks is best known for his partnership with American inventor Thomas Edison who invented the lightbulb, and was also knighted, acquiring the title Baron Marks of Woolwich. The actual building of the pavillion itself was left to the Bourne Engineering and Electrical Company. During the great storm of 1938, in which much of the Aberystwyth seafront was damaged the pier was no exception. On Friday January 14th, with wind speeds of up to 90 miles per hour battering Aberystwyth, the pier was cut in half and the new section from 1872, including the refreshments room and gallery were washed away by the rough seas. During calmer weather it is still possible to swim out beyond the end of the pier and view to metal columns which made up the structure lying under the water on the sea bed, where they have sat ever since the storm. The pier remained unchanged from the night of the storm until after World War Two, as resources were diverted elsewhere. Deemed a security risk because of the nature of the damage it was also closed to the public during this time. By the 1970′s repair work had been carried out, but the state of the end of the pier had improved very little, and it was again closed to the public. In fact it was only in 2010 that the very end of the pier was reopened to the public, after extensive repair work was carried out. Purchased by the Don Leisure Group in 1979, around £250,000 was invested into repair and restoration work on the pier, the fruits of which can be seen as it stands today. In the 1980′s the group obtained planning permission for a new pier to be built adjacent to the original pier, but work was never started much to the relief of heritage groups who saw the new project as the demise of the old Aberystwyth pier. The Don Leisure Group Ltd still own the pier at the time of writing.